“Little maiden,” said the lord-in-waiting, “I will obtain for you constant employment in the kitchen, and you shall have permission to see the emperor dine, if you will lead us to the nightingale; for she is invited for this evening to the palace.” So she went into the wood where the nightingale sang, and half the court followed her. As they went along, a cow began lowing. “No, those are frogs,” said the little maiden; “but I think we shall soon hear her now:” and presently the nightingale began to sing. The palace was elegantly decorated for the occasion. The walls and floors of porcelain glittered in the light of a thousand lamps. Beautiful flowers, round which little bells were tied, stood in the corridors: what with the running to and fro and the draught, these bells tinkled so loudly that no one could speak to be heard. In the centre of the great hall, a golden perch had been fixed for the nightingale to sit on. The whole court was present, and the little kitchen-maid had received permission to stand by the door. She was not installed as a real court cook. All were in full dress, and every eye was turned to the little gray bird when the emperor nodded to her to begin. The nightingale sang so sweetly that the tears came into the emperor’s eyes, and then rolled down his cheeks, as her song became still more touching and went to every one’s heart. 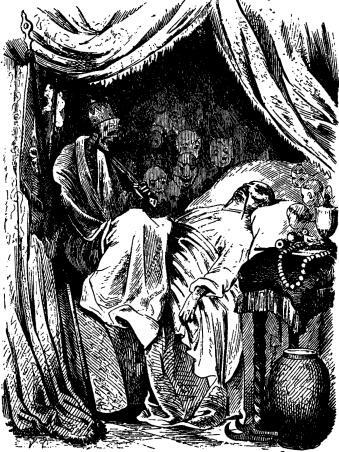 The emperor was so delighted that he declared the nightingale should have his gold slipper to wear round her neck, but she declined the honor with thanks: she had been sufficiently rewarded already. “I have seen tears in an emperor’s eyes,” she said, “that is my richest reward. An emperor’s tears have wonderful power, and are quite sufficient honor for me;” and then she sang again more enchantingly than ever. “That singing is a lovely gift;” said the ladies of the court to each other; and then they took water in their mouths to make them utter the gurgling sounds of the nightingale when they spoke to any one, so thay they might fancy themselves nightingales. And the footmen and chambermaids also expressed their satisfaction, which is saying a great deal, for they are very difficult to please. In fact the nightingale’s visit was most successful. She was now to remain at court, to have her own cage, with liberty to go out twice a day, and once during the night. Twelve servants were appointed to attend her on these occasions, who each held her by a silken string fastened to her leg. There was certainly not much pleasure in this kind of flying. “That is not a fault,” said the music-master, “it is quite perfect to my taste,” so then it had to sing alone, and was as successful as the real bird; besides, it was so much prettier to look at, for it sparkled like bracelets and breast-pins. Three and thirty times did it sing the same tunes without being tired; the people would gladly have heard it again, but the emperor said the living nightingale ought to sing something. But where was she? No one had noticed her when she flew out at the open window, back to her own green woods. One evening, when the artificial bird was singing its best, and the emperor lay in bed listening to it, something inside the bird sounded “whizz.” Then a spring cracked. “Whir-r-r-r” went all the wheels, running round, and then the music stopped. The emperor immediately sprang out of bed, and called for his physician; but what could he do? Then they sent for a watchmaker; and, after a great deal of talking and examination, the bird was put into something like order; but he said that it must be used very carefully, as the barrels were worn, and it would be impossible to put in new ones without injuring the music. Now there was great sorrow, as the bird could only be allowed to play once a year; and even that was dangerous for the works inside it. Then the music-master made a little speech, full of hard words, and declared that the bird was as good as ever; and, of course no one contradicted him. 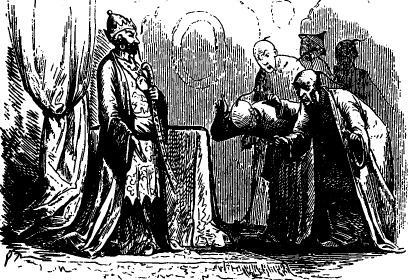 Cold and pale lay the emperor in his royal bed; the whole court thought he was dead, and every one ran away to pay homage to his successor. The chamberlains went out to have a talk on the matter, and the ladies’-maids invited company to take coffee. Cloth had been laid down on the halls and passages, so that not a footstep should be heard, and all was silent and still. But the emperor was not yet dead, although he lay white and stiff on his gorgeous bed, with the long velvet curtains and heavy gold tassels. A window stood open, and the moon shone in upon the emperor and the artificial bird. The poor emperor, finding he could scarcely breathe with a strange weight on his chest, opened his eyes, and saw Death sitting there. He had put on the emperor’s golden crown, and held in one hand his sword of state, and in the other his beautiful banner. All around the bed and peeping through the long velvet curtains, were a number of strange heads, some very ugly, and others lovely and gentle-looking. These were the emperor’s good and bad deeds, which stared him in the face now Death sat at his heart. “I know nothing about it,” said the emperor. “Music! music!” he cried; “the large Chinese drum! 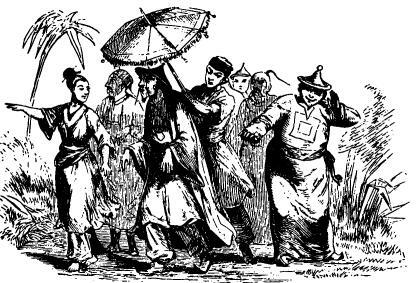 that I may not hear what they say.” But they still went on, and Death nodded like a Chinaman to all they said. “Music! music!” shouted the emperor. “You little precious golden bird, sing, pray sing! I have given you gold and costly presents; I have even hung my golden slipper round your neck. Sing! sing!” But the bird remained silent. There was no one to wind it up, and therefore it could not sing a note.